As “Game of Thrones” fans know — winter is coming! 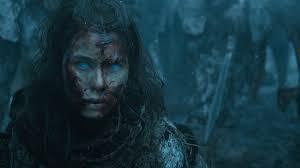 Let’s hope the white walkers don’t have night vision! We humans aren’t the best at night vision. We detect motion with direction-selective ganglion cells, or DSGCs. Some specifically detect motion from above. Some from below, or left, or right. Working together, they pick up on movement all around us. This gets harder to do in the dark. Is it possible to improve human vision in the dark? Greg Field and his team at Duke University examined slices of mouse retinas. The retinas were laid on tiny glass plates embedded with electrodes. Then, they stimulated the retinas with different types of movement in light versus dark. One type of mouse DSGC responded only to upward motion in the light. But, in the dark, it responded to motion from all directions! Without the help of any other cells! The researchers think this technology could greatly improve false eyes for visually impaired people. What’s next? Figuring out how to stimulate these cells on demand. And when we do….bring on those early sunsets over Winterfell!